Chalmers Suspensions International Inc., a Canadian manufacturer of superior truck suspension systems. Chalmers Suspensions International Inc. had a compressed air system that had reached the end of its lifecycle. Looking to optimize their energy efficiency, they decided to explore options to upgrade their system. With a requirement for three quotes, Chalmers contacted two compressor OEMs and CRU AIR + GAS to review their system and bid on the project. 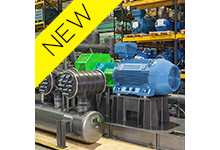 Both OEMs recommended a variable speed drive (VSD) compressor that would be installed in the existing compressor room. However CRU AIR + GAS recommended an alternative. Using a holistic approach to evaluating their existing supply and demand system, our CRU AIR + GAS team observed that the plant carried out welding in high volumes. Any metal dust could pose a danger to any new VSD compressor that would be in the plant as there was a possibility of shorting the drive. Using this critical information, CRU AIR + GAS recommended a BOGE in a BOX container system. After careful consideration of all the systems, Chalmers Suspensions International Inc. agreed with CRU AIR + GAS’s recommendations and decided to proceed with the acquisition of a BOGE in a BOX system. 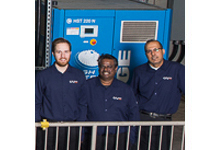 As their compressed air system consisted of a primary compressor that was 50hp, CRU AIR + GAS recommended not pursuing a compressed air audit. The Save On Energy Program has a “Prescriptive” stream of RETROFIT projects that do not require an air audit. 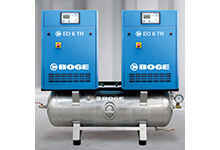 Compressors up to 75HP that are being replaced with a compressor that is VSD controlled qualify for an incentive of $100/hp as long as the new compressor is the same size as the old one.